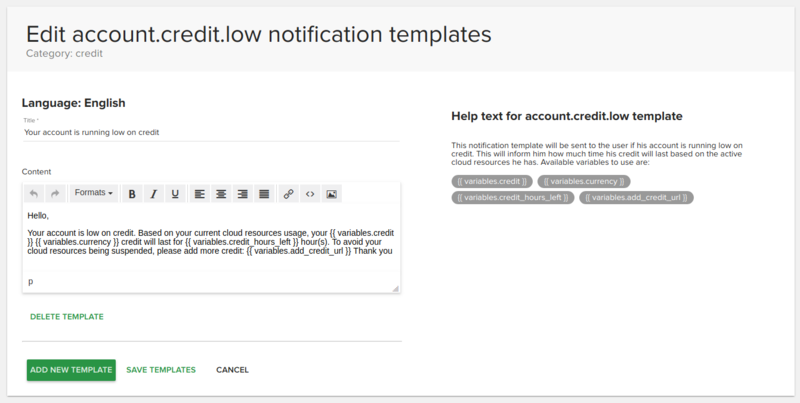 On this page you can manage notification templates that are sent to the user. You can edit current default english templates but also translate them. The user will receive the notification in his language, or the default one if a template in that language wasn’t created yet. You can use the controls from the top right side of the screen to filter, order or change the display of the templates. Users can filter templates by category and order them either by name or category. Click on a template or on the edit button to edit that kind of notification. You will enter a page like the one in the above image. As you can see, you are allowed to add a new template for this notification using another language by clicking the Add new template button. A dialog will popup where you can choose the language. After adding it a new template will appear underneath the existing ones. After you add the title and content of the notification you can click the Save templates button and all templates for that notification will be saved.